Four kids, a mini-van and a lot of love: Happy Little Monkey Review and GIVEAWAY! Happy Little Monkey Review and GIVEAWAY! Happy Little Monkey got started as a creative outlet during nap-time. Carrie wanted to make and share my favorite things with other people, as well as support her addiction to fabric! The shop has continued and grown from a little hobby of selling online to include craft show appearances, swaddling demos, and retail locations. Her goal is to create functional items that become favorites of every recipient and your 'go-to' gift to give. She loves to create personalized gifts too. I found Happy Little Monkey when I was browsing through personalized shops on Etsy. You all know how I love personalized things, especially since this is my last baby. I also LOVE to swaddle my baby. All my kids have been swaddled and I love how it gives them a sense of security. 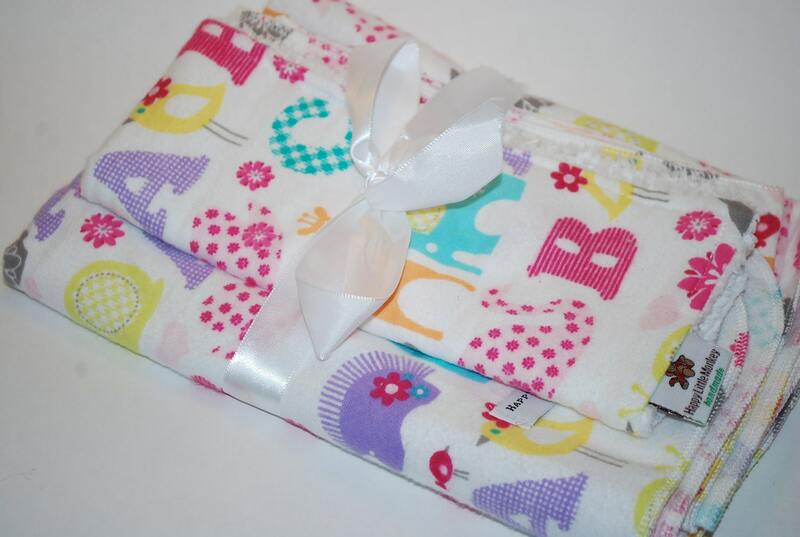 Happy Little Monkey has a variety of swaddle blankets that can be personalized. 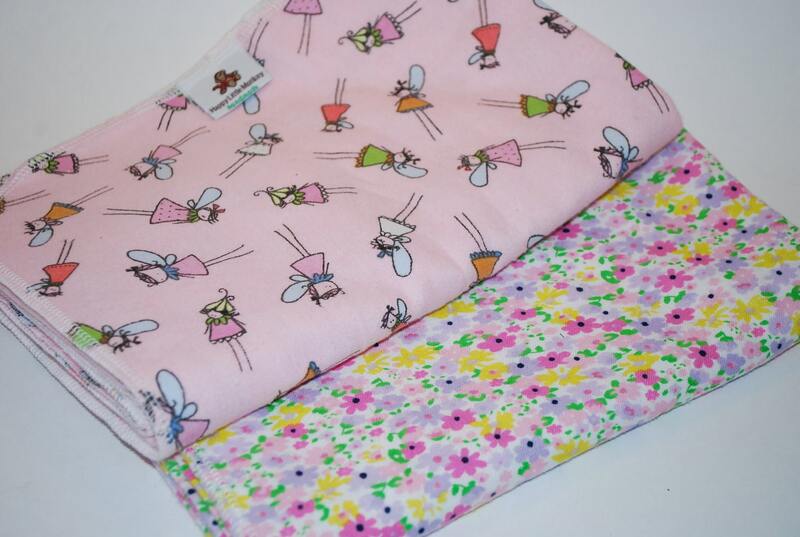 They can also be made into a matching set with burp rags and or bibs. What better gift to give than a gift set of personalized things. Everyone can use another blanket and burp rags are a must. Then come time for baby foods, the matching bib is a necessity. Happy Little Monkey adds the touch of fabric to their personalizing. 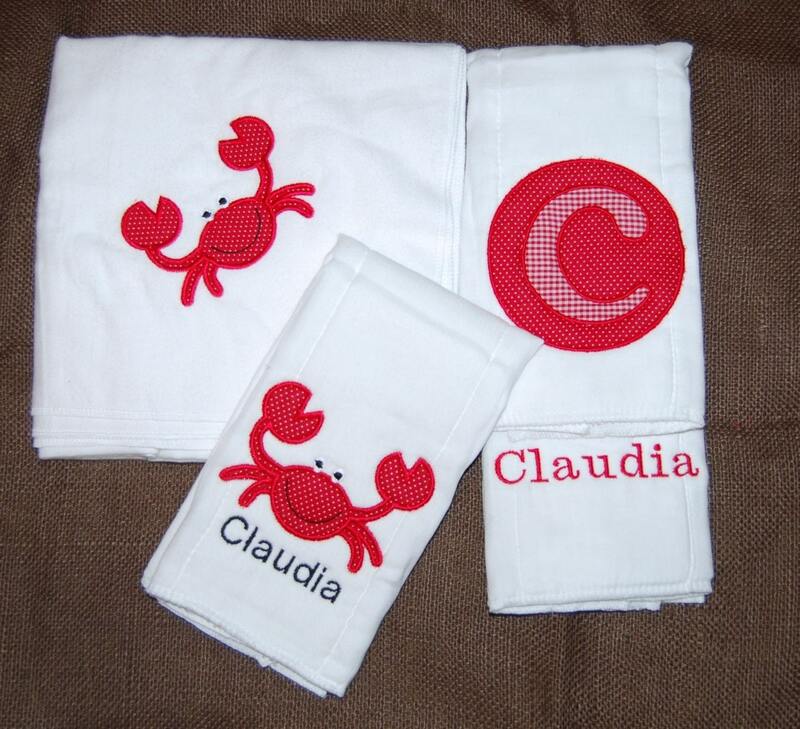 I love embroidered personalizing, but coordinating fabric added in there is awesome! Carrie had tons of graphics to personalize with and loves to create custom orders. Carrie sent me a swaddle blanket to review and also a burp rag. Since my SIL was expecting too, she sent me a swaddle blanket for her little guy too. 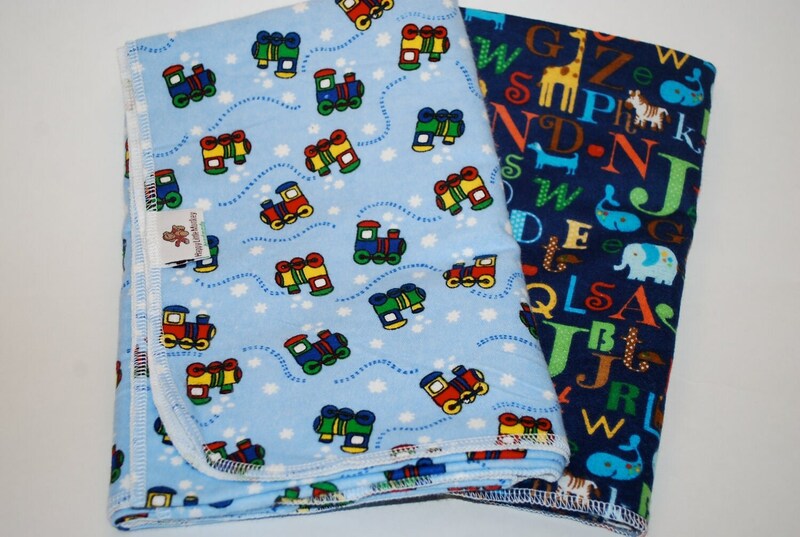 They are huge blankets to swaddle with and work great for getting the swaddle tight. They came with their names embroidered on them for a great personal touch. Blake loves being swaddled and goes to sleep very easy when swaddled. The blankets are big enough, so you do have to worry about not having enough material to swaddle with. 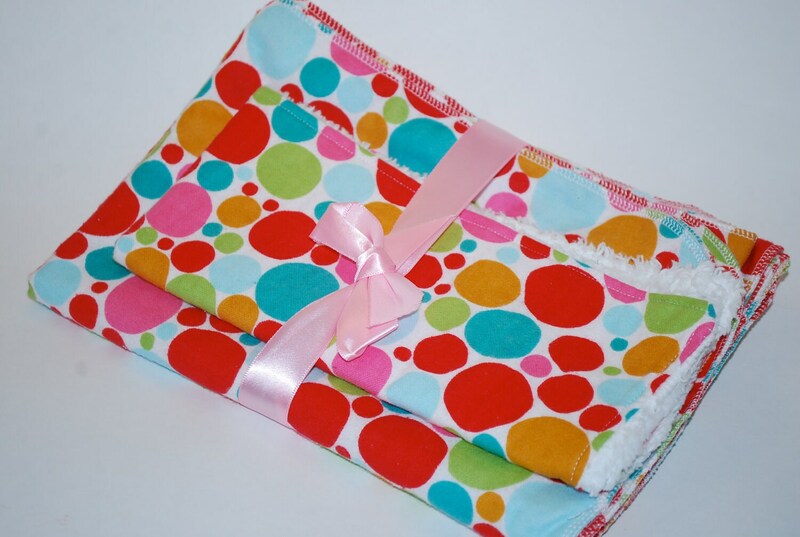 Happy Little Monkey makes a variety of blankets, bibs, burp rags and gift sets. How can you get a few more entries?! 10 extra entries- Buy something from Happy Little Monkey and let me know what you bought. i love the vehicle & stripes swaddling set. I LIKE YOUR ETSY SHOP ON FB. The Jungle Animals set is adorable! Cute shop-thanks for sharing! I just "hearted" Happy Little Monkey! Just started following---don't know how do four?!?! Love reading about your adventures! Just liked Happy Little Monkey on Facebook! I love the white, strapless, linen dresses. I liked your shop on FB. I liked Happy Little Monkey on FB. I <3 Happy Little Monkey on Etsy. 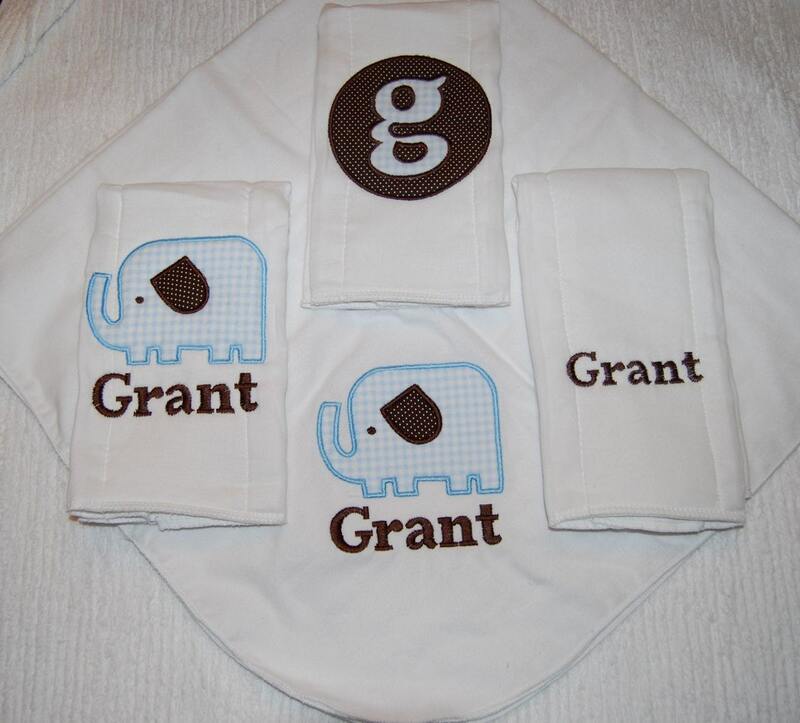 love the Elephants, Personalized Swaddling Blanket and 3 Burp Cloth Set, we are having a little g of our own! and who doesn't love Monkeys with a little monkey on the way! "Monkeys in Cream and Brown, Monogrammed Swaddling Blanket and Burp Cloth Set, Ready to Ship, FREE Monogramming"